I wasn’t a Sleater-Kinney fan. I wasn’t not a fan either. I mean, I didn’t dislike them in the active sense, I just never really listened to them. I’ve also never watched an episode of Portlandia. So why this book? Well, mostly because I won it in the raffle at the Real Vancouver Writers Series even a little bit ago. Times change. I used to be the guy that would buy an arm’s length of raffle tickets and never win anything. I’d be standing there, clutching my plethora of tickets, always the bridesmaid. All that’s long forgotten now. Now I’m the guy that shows up and wins the t-shirt every event. T-shirts coveted by others in attendance that I will likely not wear outside my house because they are either entirely too large (an XL Feminist Killjoy in a bluey sort of grey) or if my size, not exactly my colour, as would be the case this time ’round with the size M Anvil Books in hot pink. And a book about a band I did not listen to and a show that I do not watch. But I enjoyed the book. That era in Pacific Northwest music is close to my heart and brought back a lot of memories for me. Plus I think I now better understand the song “Olympia” from Ninety Pound Wuss‘ self-titled debut album. “It is completely lost on me why Jeff Suffering hates Olympia so much,” thought early-20s me. “JHC that was over 20 years ago,” realizes current me. 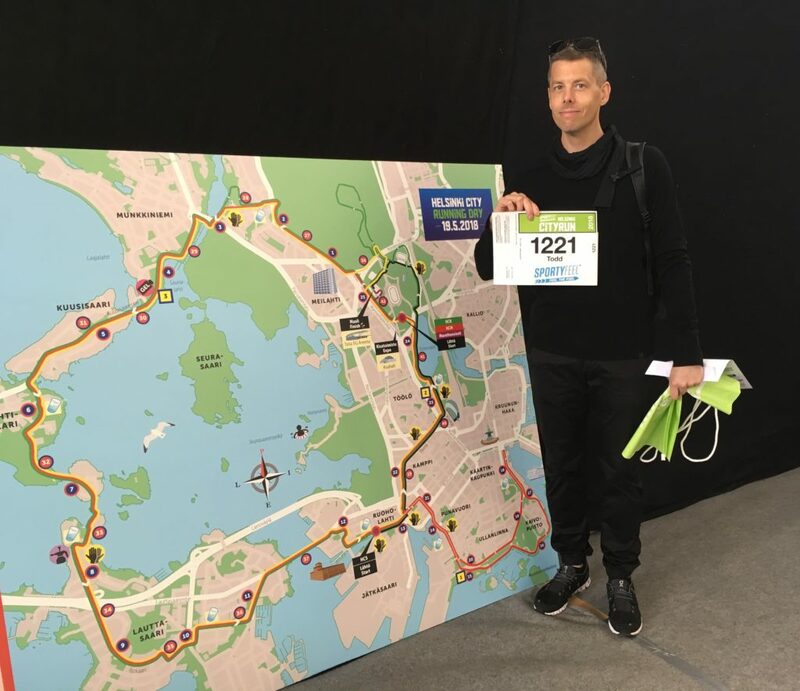 This week I flew 7,500 KM to run 21.1 which sounds cool even if it’s not quite the truth. That the Helsinki City Half Marathon was at the same time that we’d planned our annual spring sojourn was coincidence. A happy coincidence non-the-less. Friday we rode bikes to the race festival to collect my bib and race package and race t-shirt. My pink race t-shirt. My dusty pink Helsinki City Half Marathon 2018 t-shirt. Did I mention it’s pink? For those keeping track, I’ve suddenly gone from zero to two t-shirts for Anti-bullying Day. I wasn’t out to break any PBs. Rather, I wanted to run 4:37 as a bit of practice for my full marathon goal in the fall. Plus the terrain, with seaside breezes and the occasional gusty headwind, and rolling hills throughout, matches what I’m expecting in Victoria on Thanksgiving. I also thought it would be a nice test of pacing during a crowded race. And it was. The course started rather narrow, which made for a very slow first KM and I was bumped a few times before the group spread out. I was on goal up until around 15 KM, and then started to fade. The rolling hills, especially over final few KMs really killed me. The heat didn’t help either. 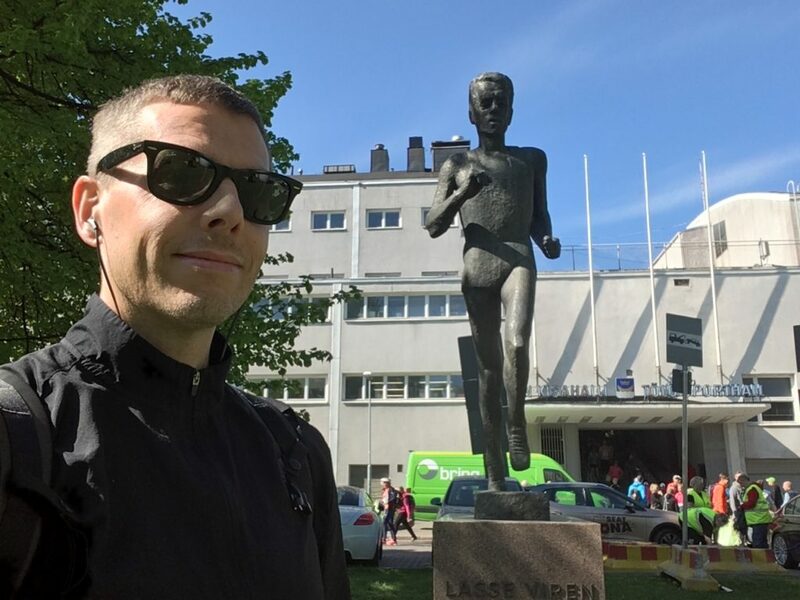 I somehow missed the final two KM markers, trusted my watch and started sprinting with what Garmin said was about 500 metres to go, and crossed the finish line inside Telia 5G arena at 1:39:09 for my third fastest chip-timed half marathon. I really wanted to be 1:37:24 but anything sub 1:40 is pretty great. 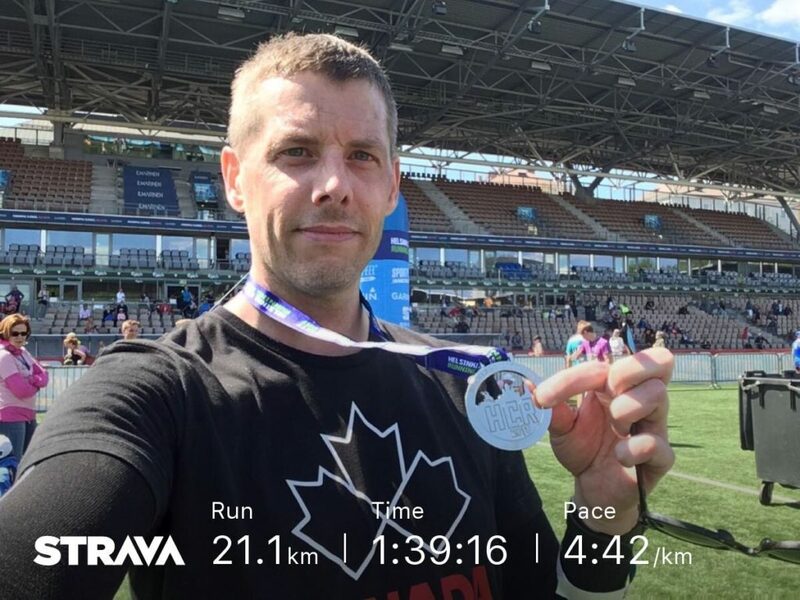 My overall impression of the course was that they’d picked a route that they really liked and then measured it and realized it was a couple KM short, so they arbitrarily tacked on a dirt trail loop through the woods behind the finish stadium to make it up to 21.1 KM. It was really weird. Otherwise, the race was fun, and the organization that put everything together had it together. I was honestly disappointed when I saw the t-shirt colour. That’s my only real complaint. 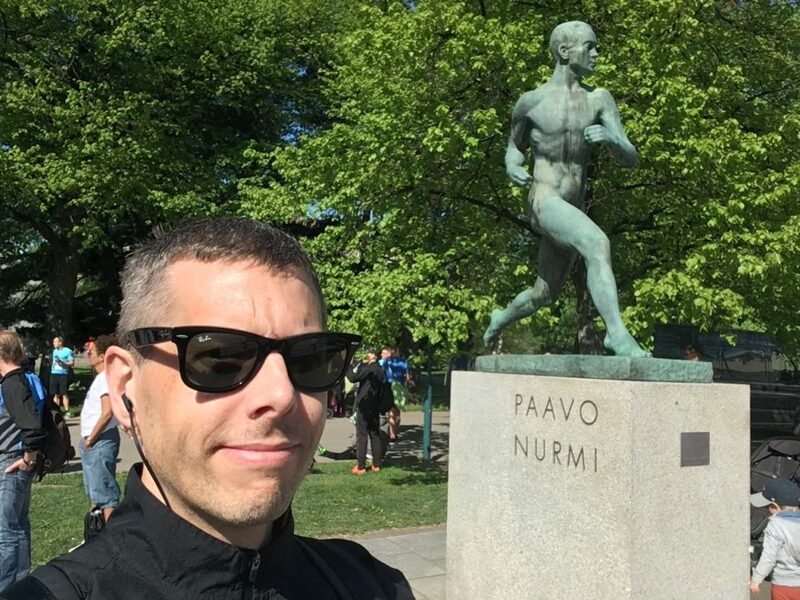 Now for a couple weeks of casual runs around Helsinki, Tallinn and Stockholm.